· Sharpen Your Career Strategy with Indeed.com Tools and LinkedIn — I’ll show attendees how to get around the Indeed.com website and how to determine job trends in some professions, where employers are hiring, and how competitive the job market is in areas around the country. I’ll also show attendees how to prioritize the different areas of LinkedIn for better visibility. · Social Media for Job Searches: Less is More — Attendees will learn which social media sites hiring managers frequent (and why), and how not to spread themselves too thin to avoid diluting their professional brand, visibility, and expertise. If you have a job- or career-related question, stop by the Career Connection booth where you’ll likely find one of the experts available to answer it and provide any suggestions to help you sharpen your career strategy. Or schedule a session in advance to reserve your spot. See you in Baltimore! Donn LeVie Jr. has more than 25 years in various hiring manager positions for companies in oil and gas exploration, software development, and microprocessor design. He was an adjunct faculty lecturer with the University of Houston Department of Mathematics and Natural Science. Donn is the author of Confessions of a Hiring Manager Rev. 2.0 (Second Edition) which was the Winner of the 2012 International Book Award for Jobs/Careers and Winner of the 2012 Global eBook Award for Careers. Donn’s new books, The Art of the Unfair Advantage: Make Yourself the Hiring Manager’s Candidate of Choice for ANY Job in ANY Economy and The Valueocity Factor: Turbo Charge Your Career Strategy for Inside and Outside the Organization in ANY Economy will be available later this year. 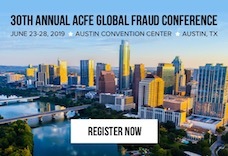 Donn has been a career strategist and presenter at the Annual ACFE Global Fraud Conference since 2009.